Let's get February started. I am still playing blog catch up with my January reads, but not for much longer. Since I don't reaqd a book a day, soon there will be a book blogging lag. I am thinking you will be grateful. My 8th book for 2019. Finished reading it on 1/15/2019. Bosnia is a country I don't know much about. I have to say - after reading this book, I am no wiser about the country itself, but I did learn a lot about what it was like for a little girl to live during a war that occured as I was graduating from high school. This is the diary of a girl named Zlata. 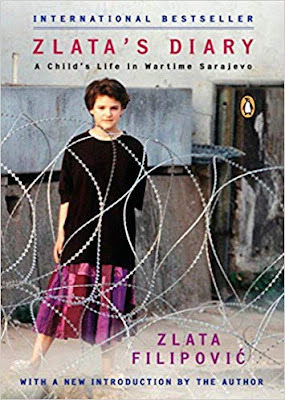 In the early 1990s when Zlata was 11 years old and enjoying a typical young girl's life, a war was starting. The diary becomes what it is like for her living in Bosnia furing World War II like conditions. Quickly electricity became scarce and then non-existent. Water, gas, and food became things to ration carefully. Winter came and Zlata's family had to start to burn furniture just to keep warm. Zlata had started her diary shortly before the war broke out, and for 2 years she kept almost a daily account of what was happening around her. Through the eyes of a young girl, we learn what war was like for children. And at the age of 13, when she finally escaped to Paris with her family and she was free from Bosnia's war, the relief she felt was expressed and she never looked back. This was a quick read, and an interesting perspective of the war. This was no Anne Frank's diary (much less detail). We get to hear what it was like for a child. I have two 12 year old children myself, and I can imagine them writing the exact same way if they kept a diary. It is innocent and focuses on what children miss the most and how very little understand they have of grown up problems. It is a good read. I encourage you to try it for yourself. I really like this idea of reading the world. And I'll be honest, Bosnia is not a country I think of often, but I'll definitely check this out!